Due to climate change, rainfall is becoming scarcer and less reliable in many parts of the world, jeopardizing the agricultural income of already vulnerable populations. Technologies that facilitate water storage within soil and replenishment of soil nutrients could help farmers adapt to climate change. However, farmers may choose to not adopt these technologies due to high costs or a lack of training. In partnership with Niger’s Ministry of Environment and Sahel Group, researchers are evaluating the impact of a rainwater harvesting technique, demi-lunes, on farmers’ soil quality, yields, and profits. Researchers will randomly assign farmers in 180 villages to one of three treatment groups that will receive a combination of training and cash transfers to construct the demi-lunes or to a comparison group. Due to climate change, rainfall is becoming scarcer and less reliable in many parts of the world, jeopardizing the agricultural income of vulnerable populations. Given uncertain weather conditions, farmers face poor growing conditions and challenging investment and planning decisions, which will affect production yields and incomes. To cope with changing rainfall, small-scale farmers in West Africa have typically moved into farming additional, potentially less fertile agriculture. Yet, increasing population density has reduced the availability and accessibility of arable land, making this strategy unsustainable in the long term. Technologies that improve the level and duration of water stored within the soil and help replenish soil nutrients could help farmers increase yields and adapt to climate change. However, farmers may not adopt these technologies due to high costs or a skills gap. Can cash grants and training increase adoption and help farmers protect themselves from climate change? Rain-fed agriculture in the Sahel region of sub-Saharan Africa faces low and erratic rainfall patterns and strong winds, which contributes to soil erosion and degradation. Approximately 50 percent of farmland in West Africa now suffers from nutrient depletion and poor soil fertility. In these semi-arid regions of Africa, promising technologies for collecting soil runoff and increasing the nutrient content include micro-catchments called demi-lunes, or half-moons. This study focuses on demi-lunes, which are the most appropriate rainwater harvesting technique (RWH) for the types of soils in Niger. To construct demi-lunes, farmers form mounds of soil in half-moon shapes that will concentrate rainfall and reduce runoff. On-farm trials in the Sahel suggest that demi-lunes can significantly reduce soil erosion and degradation and minimize risk of crop failure, but adoption remains low. Fewer than 10 percent of small-scale farmers in Niger use micro-catchments, such as demi-lunes, on any of their land. Previous research on adoption of demi-lunes in the Sahel suggests barriers to adoption include farmers being unaware of the technical specifications, a lack of cash at the time of construction, and farmer’s perceptions of the costs and benefits. 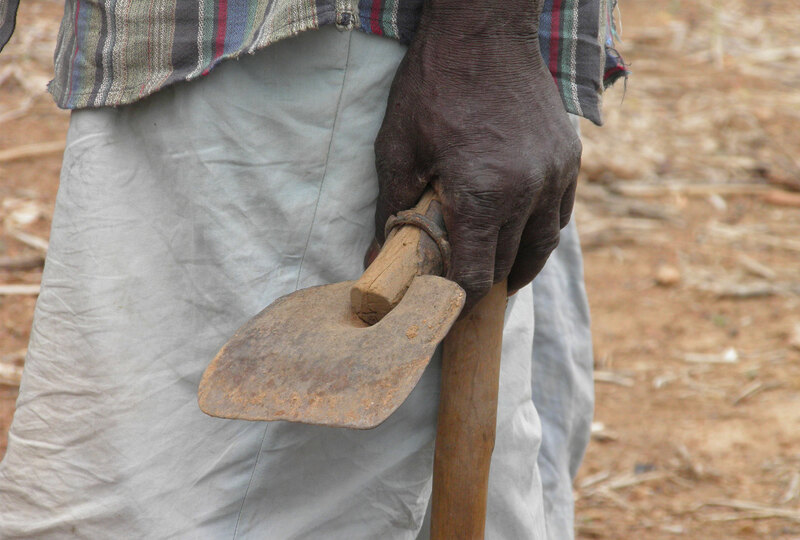 Farmers in Niger struggle with soil erosion and degradation. In partnership with Niger’s Ministry of Environment, Sahel Consulting Group and NGOs, researchers are evaluating the impact of demi-lunes on farmers’ soil quality, yields, and profits. Researchers will randomly assign farmers in 180 villages to one of three treatment groups that will be stratified by geographic region and sub-region to receive a combination of training and cash transfers, or a comparison group that will not receive training nor cash transfers. 1) Training: To test if a lack of information constrains adoption, farmers in 45 villages will receive basic training for RWH techniques, including discussion of costs and benefits. Field staff from the Ministry of Environment will conduct this hands-on training in January, just after harvest. 2) Training + UCT: To test if a lack of cash constrains adoption, farmers in 45 villages will receive training by the Ministry of Environment, as well as an unconditional cash transfer (UCT) in February, one month after training. Researchers will randomly assign farmers in this group to either a high or low transfer amount. The high transfer will approximately equal the total labor costs associated with constructing demi-lunes on one hectare of land and the low transfer will amount to half of these costs. 3) Training + CCT: Similar to the UCT group, farmers in 45 villages will receive training on RWH techniques and a cash transfer conditional on the number of demi-lunes of acceptable quality constructed on their land. The Ministry of Environment will announce this offer one month after the training and will verify farmer’s eligibility for the conditional cash transfer (CCT) in May, three months later. Researchers will randomly assign farmers in this group to either a high or low CCT amount which will be proportional to the amounts of the UCT. 4) Comparison: Farmers in 45 villages will not receive any training or transfers. Over two years, researchers will collect information on farmers’ knowledge of soil quality, RWH adoption techniques, access to financial services, and agricultural production, including yields. Researchers will also collect samples to test soil quality. In addition, researchers will conduct monitoring visits in February and August of each year, the period when farmers would construct demi-lunes, to observe the timing and quality of construction.